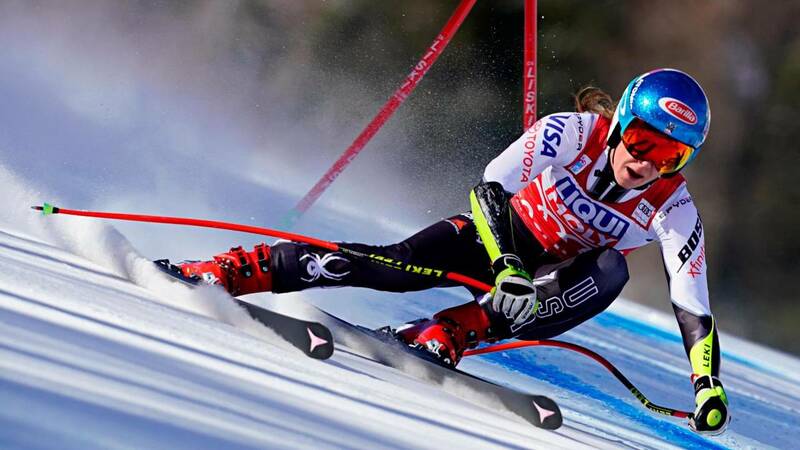 While Mikaela Shiffrin continued her march towards greatness with a super-G win in Cortina on Sunday, Lindsey Vonn failed to finish what is likely to be her last competitive outing on the Italian course. (CNN) - A golden career may have finished sooner than expected. While Mikaela Shiffrin continued her march towards greatness with a super-G win in Cortina on Sunday -- her 54th career World Cup win -- Lindsey Vonn failed to finish the race and later told reporters that she may have competed in her last race. Vonn, the greatest female skier in history with 82 career victories, needs five more wins on the World Cup circuit to beat Ingemar Stenmark's record of 86. At the conclusion of the weekend's racing, Vonn said retirement was a "possibility" before quickly adding: "But I'm emotional right now." "I have to really think clearly about that. It's not a decision I make lightly or quickly," Vonn was quoted in a number of media outlets as saying, citing Associated Press. "I really don't know what to think at this point. Definitely isn't the way I had hoped that things would go. I've been able to fight through a lot of injuries in my career but I think my injuries might get the best of me at this point. "I'm going to give it a couple of days and make some decisions." The 34-year-old competed in Italy with braces on both knees and her best performance was ninth in Saturday's downhill. Following Sunday's super-G, Vonn broke into tears after being presented with a bouquet of flowers by the Olympic downhill champion Sofia Goggia in the finish area. She has achieved much on the Italian slopes, holding the record for 12 wins. It was also in Cortina she achieved her first podium and later broke the overall women's World Cup record in 2015 with her 63rd win. "It's more emotional than I expected. You know that the end is coming but it doesn't make it any easier," Vonn said. Speaking to CNN's Alpine Edge last week, Vonn said she has become increasingly fearful of the onset of arthritis should she race on to try to become the most successful skier ever. "I want to be able to walk without pain when I'm older and hopefully some day I'll be able to ski with my kids and that's important to me," Vonn said while in Cortina. Vonn also told Alpine Egde that she expected compatriot Shiffrin, who has won 11 times this season and is fourth on the women's all-time list, to "break many records." Should Shiffrin continue her current dominance of women's skiing, the 23-year-old will likely reach the top of the all-time list while still in her 20s. But the most immediate record on Shiffrin's radar will be Vreni Schneiter's for most wins in a season. The Swiss won 14 times in the 1988-89 season. The American finished in 1:22.48 in Italy to secure her third super-G win of the season, while Lichtenstein's Tina Weirather (+ 0.16) was second and Austria's Tamara Tippler (+ 0.18) third. Elsewhere, Marcel Hirscher, the most dominant male skier of his generation, had to settle for third in the slalom in Wengen as France's Clement Noel claimed his first World Cup win. The 21-year-old Frenchman followed up last week's second place in Adelboden with a sensational first in Switzerland on Sunday. He was 0.47 seconds ahead of Austria's Manuel Feller after the first run, with Hirscher off the pace, and did enough in the second run to secure victory by 0.08 seconds. Austria's Feller was second with Hirscher (+0.91) third, bringing an end to the Austrian's run of three consecutive victories.